Kat, from Kitsch Snitch, created a new tag all about blushes earlier this year (check it out here). I've been loving reading everyone's answers, so I thought that I would join in. Originally I would have said pink blush, but over the last 2 years I've fallen in love with pinky peach blushes. Anything too orange looks strange on me and anything too dark pink just makes the natural redness on my cheeks look worse. Pressed. I find them easy to use, apply and blend out. Pressed is also the most popular, so there are billions of options out there. 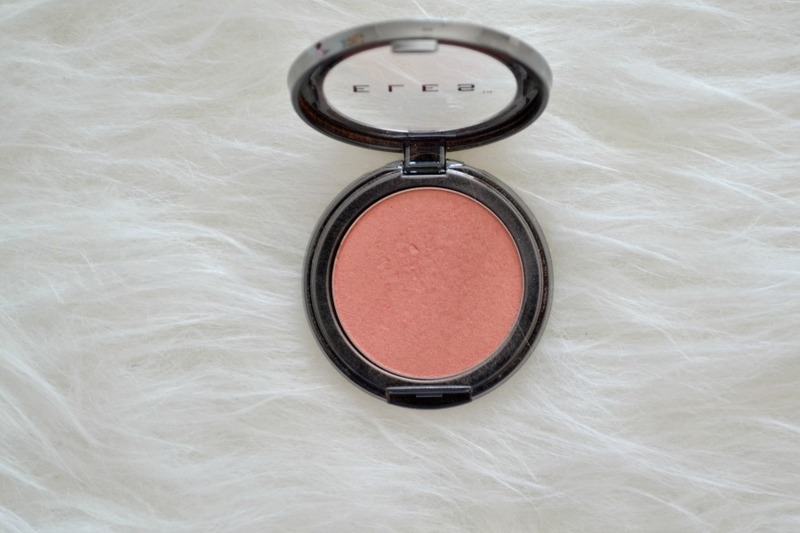 Without a doubt it's my ELES Mineral Blush Compact in "Coral Sun. "* I love it because it gives me a gorgeous glow without having any glitter in it. It's a highly pigmented blush that looks barely touched even though I've used it a hundred time. You can see swatches of it here. I don't have many matte blushes as I prefer glowy blushes, but I do love the ELES Mineral Blush Compact in "Mixed Berries. "* Even though it's not marketed as a matte blush, it's not shimmery or glowy at all. 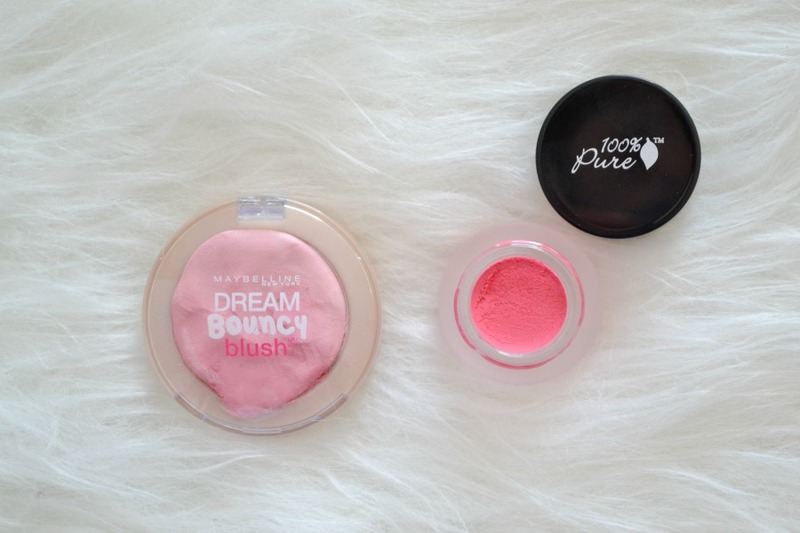 I was afraid of cream blush for the longest time after trying it once and it looking awful but after using the Maybelline Dream Bouncy Blush I love cream blush. I bought this from ebay as they've never released the bouncy blushes in Australia, but its a beautiful cream blush that turns to a powder. It has a really unusual texture, hence the name bouncy in it's name. Recently I've been loving the 100% Pure Pot Rogue Posey. * This is a gorgeous pinky cream blush. It sinks easily and quickly into the skin and looks so natural. I can either use it with my fingers and pat it into the skin or buff it in with a brush. The key to using a cream blush is to apply a very small amount and apply more if you need to. Also work it in to stop any harsh lines. Again I would say the 100% Pure Pot Rogue Posey* cream blush. It's very bright in the pot, but is very easy to sheer out. I would have to say it would either be the Luma By Jess Hart Powder Blush in "Soft Peach" or ModelCo Blush Cheek Powder in "Peach Bellini." 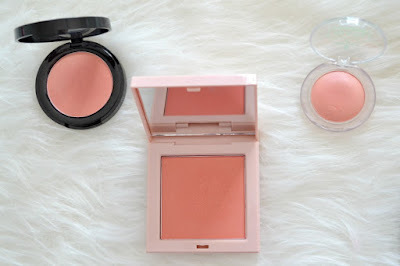 They're both quite similar to the ELES blush, but much more affordable. 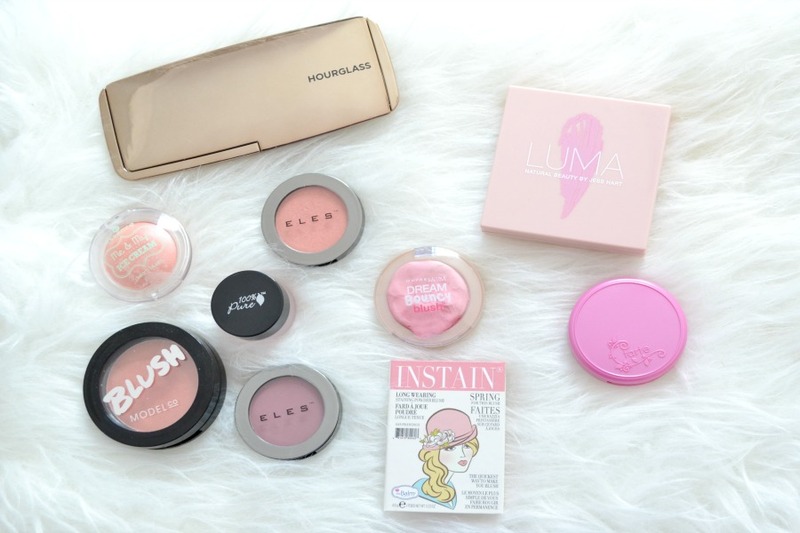 You can see swatches of the Luma blush here. Another one that I like is from Essence, but it's from a past collection. It's a sheer apricot colour that's perfect for the days when my pigmentation is really noticeable and I want to stay away from pink based blushes. The Tarte Amazonian Clay 12hr Blush was a let down for me. It's not a bad blush, but it wasn't as incredible as everyone said it was. The pigmentation was great and it's easy to use. I wouldn't say don't buy it, just don't expect a life changing product. It has to be the Hourglass Ambient Lighting Palette. It's a gorgeous blush palette that has 3 very different blushes, so it's a good one to reach for when I'm not sure what to wear. It has to be the Hourglass Ambient Lighting Blush Palette. The outer packaging is a beautiful gold colour. It has a mirror inside of the palette too, which makes it a really great palette to travel with. Another one that I really like is theBalm Instain Blush in "Argyle. "* It has cute packaging (like all theBalm products), but it does have an outer cardboard packaging that's a bit useless and just makes the product more time consuming to use. I'd love a Tom Ford blush, although I couldn't spend the $85 it costs for one!! Strangely enough I would be ok with spending $85 on a make up brush, but not on a blush!! 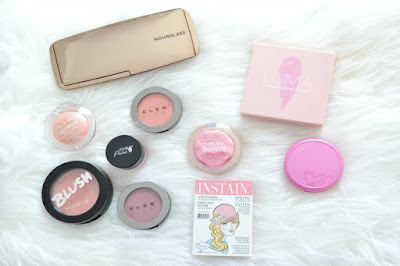 Otherwise ELES released some baked blushes recently and they've been on my wishlist. It's my most worn, most loved and favourite blush that I have. And that's the blush tag. What's your favourite blush brush? I would have to say I couldn't live without this Make Up Forever Double Ended Sculpting Brush. They've since changed the look of it to this. I mostly use the angled side to apply my brush, but find the rounded side useful for when I've applied too much blush or have harsh edges when using a brighter blush. 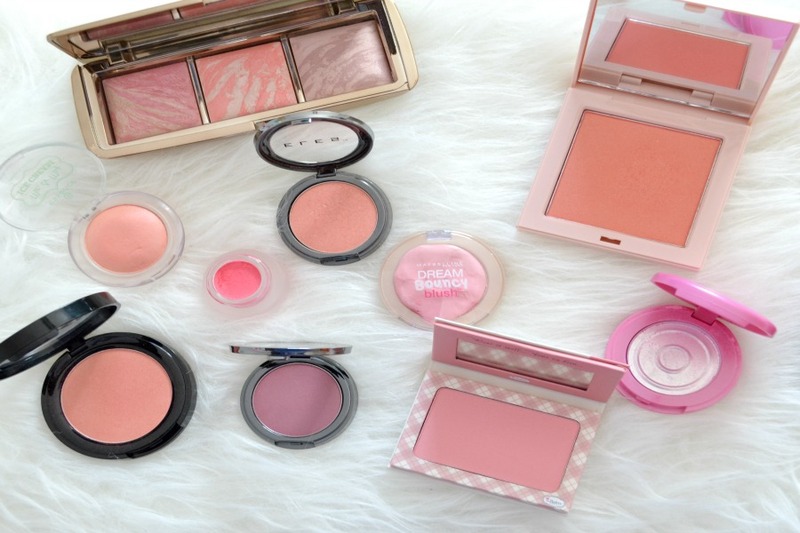 You have a nice assortment of blushes!! 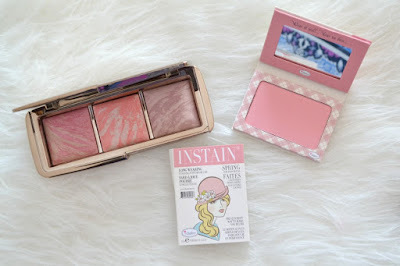 I really want to try the InStain blushes, I've heard such nice things about them! They're really fantastic! I don't know why there's not more hype around them. Thanks DT :) Haha you can tell I'm obsessed with pink. 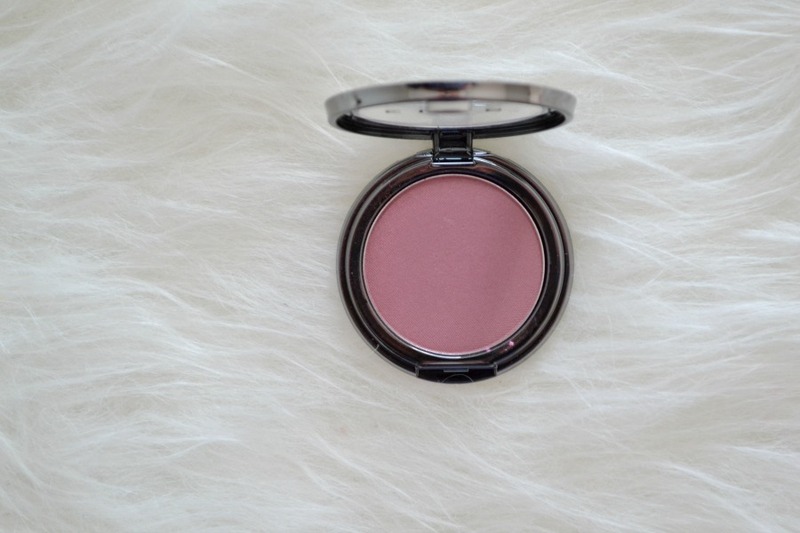 I am so curious with that ELES Mineral Blush Compact in Mixed Berries. It seems like a good one. Love the shade. It's a really beautiful blush. It's not as intimidating as it looks. Just use a light hand.